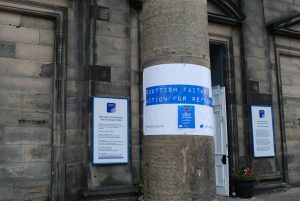 Tuesday’s Working Together in Faith Conference in Edinburgh examined how individuals and groups could grasp policy, advocacy and practical action as they exercised their faith. You can get a flavour of the event from the tweets posted using the #SFARConference hashtag. 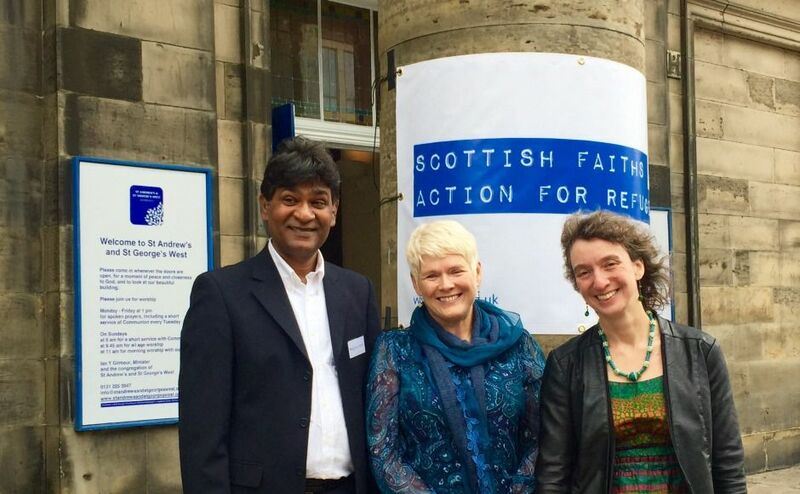 Part of the Refugee Festival Scotland, the joint-faith event opened with a reflection from David Bradwell. 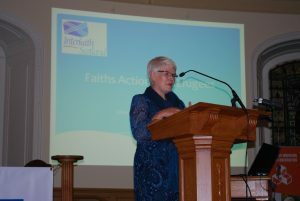 Mr Umeed’s talk was followed by Dr Maureen Sier’s presentation, director of Interfaith Scotland. She began with a refugee story from her own family and looked back at comments made by David Logan MP in a Parliamentary debate in 1938: “today, an opportunity is offered to the British nation to take its proper stand among the nations of the world to protect a minority”. She finished her presentation by quoting passages relevant to different faiths’ appreciation of asylum and migration. 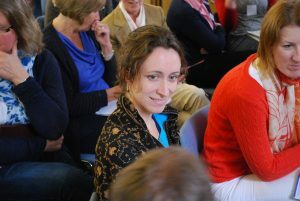 Alison Phipps is professor of languages and intercultural studies at the University of Glasgow and convenes GRAMnet (Glasgow Refugee, Asylum and Migration network). Her journey into the conference’s topic began when she responded to a call to visit detention centres. (She quickly discovered that football was a more universal language than her own European languages!) Opening up and sharing her home with asylum seekers for the last ten years, Alison movingly recounted how she came to foster her daughter and described the ongoing struggle navigating through the official asylum process. Alison noted that while the European Union has binding obligations to help in instances of mass displacement, few countries meet those obligations. The number of refugees Europe has welcomed is “pitiful and utterly pathetic”. She spoke about the need to “activate compassion” and infected delegates of the conference with an urge to do more and lay aside all excuses for inaction. Parallel workshop sessions allowed delegates to find out about running Weekend Clubs for asylum seekers, refugees and new migrants, a workshop lead by Mohamed Omar from Interfaith Glasgow. 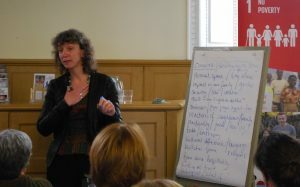 Alison Phipps held an interactive session on hosting asylum seekers and refugees; on the “do’s and don’ts” as well as the fears and joys. Christian Aid talked about how we can influence the fluctuating media narrative about those seeking refuge in the run up to the UN Summit on Refugees in September 2016. After lunch, further workshops examined the community sponsorship scheme (to allow individuals, charities, faith groups and businesses to support resettled refugees directly), the plight of refugees and internally displaced persons in Northern Iraq, and a quick masterclass in lobbying politicians on refugee issues from Naomi McAuliffe, Head of Amnesty Scotland. Rev Kathy Galloway closed the conference with her reflection on the CTBI delegation of women who visited refugees in Greece which she led at the end of May. On her return she found herself in the situation of being asked by her four year old granddaughter “What’s a war, Granny?” Kathy was silenced – how could you possibly respond to such a question? The daunting nature of the refugee crisis should not put us off intervening.